Jim Fassett received BSc and MSc degrees in geology from Wayne State University, Detroit, MI, in 1959 and 1964. He worked for the USGS from 1960 until June 2000 when he retired and moved to Santa Fe, NM where he continues his research as a USGS Emeritus Scientist. Jim is primarily a stratigrapher-geochronologist with an emphasis on the coal, coal-bed methane, and conventional oil and gas deposits of the Upper Cretaceous of the Western Interior of North America and he has published widely on the depositional environments of the rocks containing these energy resources. In addition to his energy-resource studies, Jim has conducted an intensive study of the K-T interface in the San Juan Basin and the Western Interior of North America. In 1988 he was awarded a USGS Gilbert Fellowship to pursue those studies exclusively for one year in collaboration with colleagues from the U.S.G.S. and academia. That work involved detailed stratigraphic, paleomagnetic, radioisotopic, and paleontologic (vertebrate, invertebrate, and palynologic) studies of rocks adjacent to the K-T interface. Much of the data obtained from that study, including geochemical analyses of Cretaceous and Tertiary dinosaur-bone samples, was synthesized in a 2002 report in GSA SP-356 entitled: “Dinosaurs that did not die: Evidence for Paleocene dinosaurs in the Ojo Alamo Sandstone, San Juan Basin, New Mexico”. Jim’s research on the Lazarus dinosaurs that survived the Cretaceous-Tertiary asteroid-impact event and the geochronology of the K-T interface in the San Juan Basin is ongoing supported by a Bradley-Scholar grant for USGS emeriti scientists. These studies are being carried out in collaboration with colleagues from the USGS, Denver, CO, the New Mexico Institute of Mining and Technology, Socorro, NM, and the University of Alberta, Edmonton, Alberta, Canada. 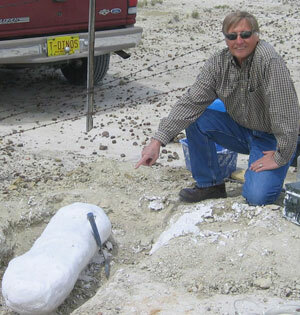 Photo caption: The author at a dinosaur bone collection site in the southern San Juan Basin, May 13, 2004. Bone site is in uppermost Kirtland Formation of late Campanian age. Bone was collected by Andrew B. Heckert, at that time with the New Mexico Museum of Natural History and Science, Albuquerque, New Mexico, photograph by Heckert.